Groupe Bluegrass US composé de John Duffey, Ben Eldridge, John Starling, Tom Gray et Mike Auldridge. "We try to find material that's a little bit different, and approach the music in a little bit broader way than most bluegrass bands do," said the Seldom Scene's Dudley Connell to The Baltimore Sun in 1998. Since their inception in 1971, the Seldom Scene have thrived on playing bluegrass a little differently than everyone else. If other bands used a fiddler, the Seldom Scene used a Dobro; if others relied on old standards, the Seldom Scene played rock classics like J.J. Cale's "After Midnight." Through skilled musicianship and an urban approach to bluegrass, the Seldom Scene have become one of the most influential -- if not the most influential -- bluegrass band of their time. 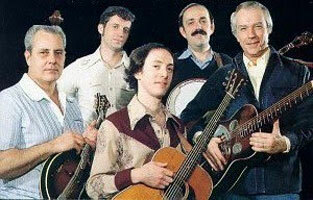 In 1971, mandolinist John Duffey, banjo player Ben Eldridge, guitarist John Starling, bassist Tom Gray, and Dobro player Mike Auldridge formed the Seldom Scene. The band derived its name from its once a week performances, first at the Red Fox Inn in Bethesda, Maryland, and later at the Birchmere Restaurant in Alexandria, Virginia. Early albums like 1973's Act 1 and 1975's Live at the Cellar Door set the pace for progressive bluegrass while defining a unique sound that included Starling's smooth Vocalss, Duffey's versatile tenor, and Auldridge's ringing Dobro. The band's smooth harmonies, love of eclectic material, and Duffey's colorful stage antics further separated the band from its peers. In 1977, Starling left the group to return to his medical practice and was replaced by Vocalsist Phil Rosenthal. The addition of Rosenthal and a change of labels to Sugar Hill did little to alter the Seldom Scene's basic sound. The group's first two Sugar Hill albums, 1978's Act Four and 1981's After Midnight, continued to draw material from traditional sources like Jimmie Rodgers and contemporary ones like Eric Clapton. The later album included both "Lay Down Sally" and concert favorite "After Midnight." When performing live, the group enjoyed stretching out songs like "After Midnight," allowing Duffey and Auldridge to take extended solos that sounded closer to jazz than bluegrass. 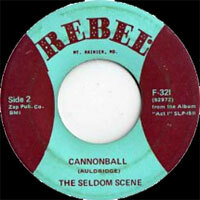 In 1986, after making five albums with the Seldom Scene, Rosenthal departed and was replaced by Lou Reid. Original bass player Gray also left, making room for T. Michael Coleman. With the addition of two new bandmembers, the Seldom Scene recorded the appropriately titled Change of Scenery in 1988. Some fans objected to Coleman's electric bass, but despite this "progressive" change, albums like 1990's Scenic Roots proved to be more traditional than earlier efforts. The band also had a talent for turning pop songs like the Beatles' "What Goes On" into standard bluegrass material. In 1993 Reid left the band and was replaced with ex-member John Starling. Although Starling remained with the band for only a year, his return proved a real treat to fans of early-'70s lineup, as did the Seldom Scene's 1994 recording Like We Used to Be. 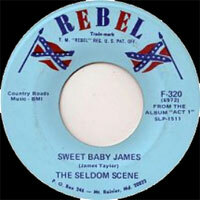 In 1995 and 1996 the Seldom Scene weathered more changes than several bands combined. In 1995, dissension came to surface within the Seldom Scene because of their light touring schedule and the feeling among certain members that the band had lost its progressive edge. Singer Mondi Klein, bassist Coleman, and original member Auldridge parted ways with the band to turn the progressive bluegrass band Chesapeake into a full-time project. The Seldom Scene's remaining members recruited Dobroist Fred Travers, bassist Ronnie Simpkins, and former Johnson Mountain Boys singer Dudley Connell. Together, the re-formed band recorded 1996's Dream Scene. Before the band could consolidate its new lineup, founder and spiritual leader Duffey died of a heart attack. "John was 80 percent of the Seldom Scene," Eldridge told The Boston Herald, and no one, not even the band, could picture continuing without him. "The last year has been real tough for the band," Connell admitted to The Baltimore Sun in 1998. "Because [John] was not only a wonderful musician and singer, but also kind of the personality of the band." Still, many wanted the band to continue, and the year-old lineup wanted to carry on the work they had begun with Duffey, so they recruited ex-member Lou Reid to help out on Vocalss and play mandolin. While Eldridge is the only remaining original member, the band continues to carry the spirit set forth by the Seldom Scene in 1971. Their 2000 recording Scene It All features both ringing Dobro and tight harmonies, as well as covers by Chuck Berry, Bruce Springsteen, and Bob Dylan, while 2007's Different Roads anthology and the all-new Scenechronized continue the group's love affair with melody and impeccable musicianship. In what turned out to be a reunion of sorts, the band welcomed back both Starling and Gray to rework many of the band's most requested live songs for their 2014 studio album Long Time...Seldom Scene, which featured guest spots from Emmylou Harris, Chris Eldridge, and Rickie Simpkins. It was also the band's first recording for the Smithsonian Folkways label. The Seldom Scene continues to garner both critical acclaim and adoration from a legion of fans, emerging at the forefront of progressive as well as traditional bluegrass bands, continuing to amaze fans and influence future generations of musicians. 1972 LP 12" REBEL SLP-1511 (US) ACT 1 - Raised By The Railroad Line / Darling Corey / Want Of A Woman / Sweet Baby James / Joshua / Will There Be Any Stars In My Crown / City Of New Orleans / With Body And Soul / Summertime Is Past And Gone / 500 Miles / Cannonball / What Am I Doing Hanging 'round?